In this guide, I pass on my Matterhorn tips to all photographers. 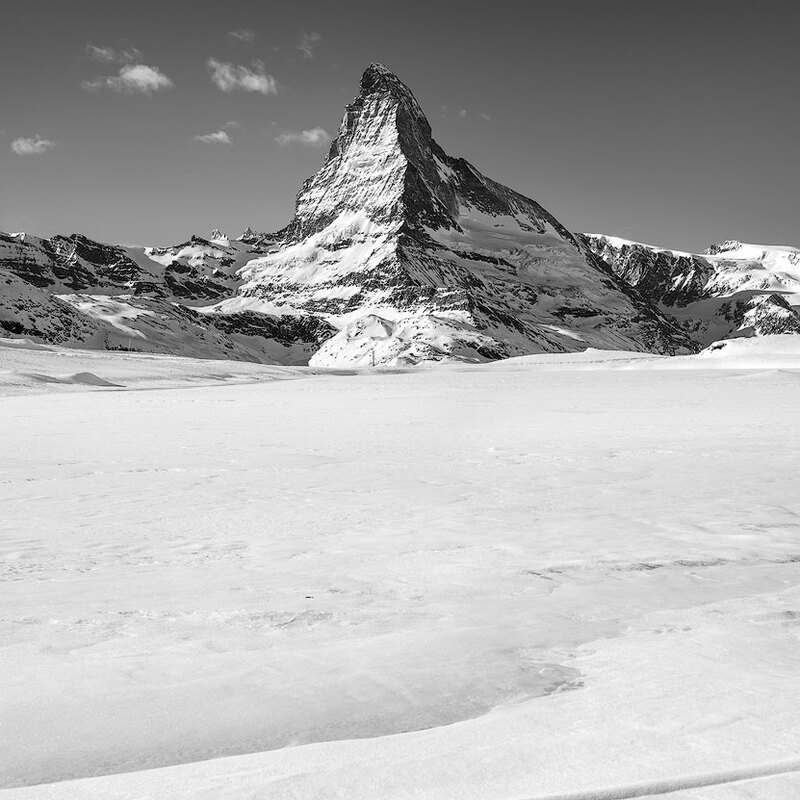 I am skiing, hiking or photographing at least twice a year in Zermatt. 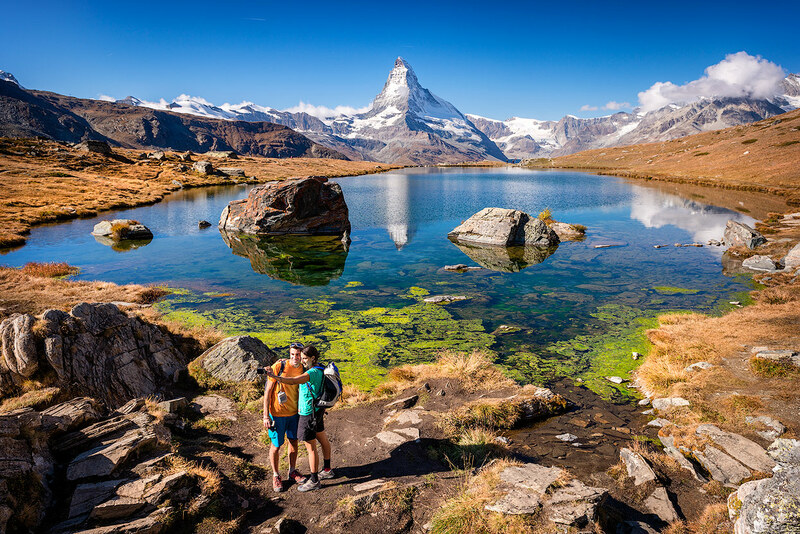 A one-week stay is recommended, as the weather always provides surprises and because Zermatt is on the other hand an outdoor and adventure paradise, which allows a variety of activities. 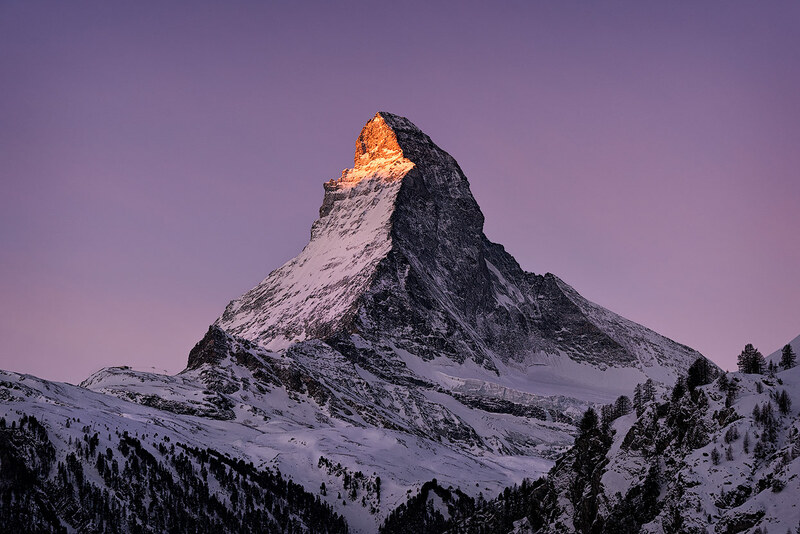 It is not cheap, neither for Swiss nor for foreigners, but even with a limited budget you can enjoy the Matterhorn. The mountain weather Is very unpredictable and here we have a big advantage for Swiss: we just wait for the weather report and plan our journey on short notice when the forecasts are good. Nightphotographers naturally follow the moon phases and the Milky way, though the light pollution in Zermatt is now quite large. 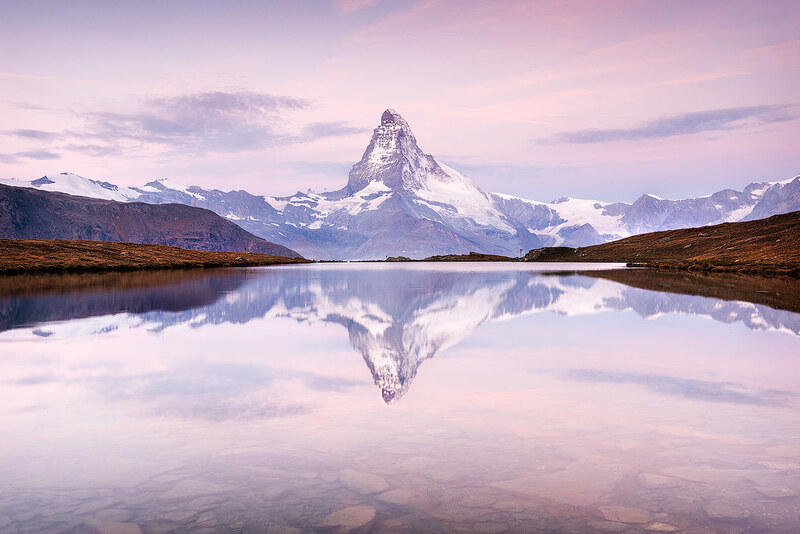 For a shot of the Milky way behind the Matterhorn with a reflection in the Stellisee a bit of luck is required, but you will be rewarded with an unforgettable photo. But the full moon also has its charm, which makes the white mountains visible in the night. 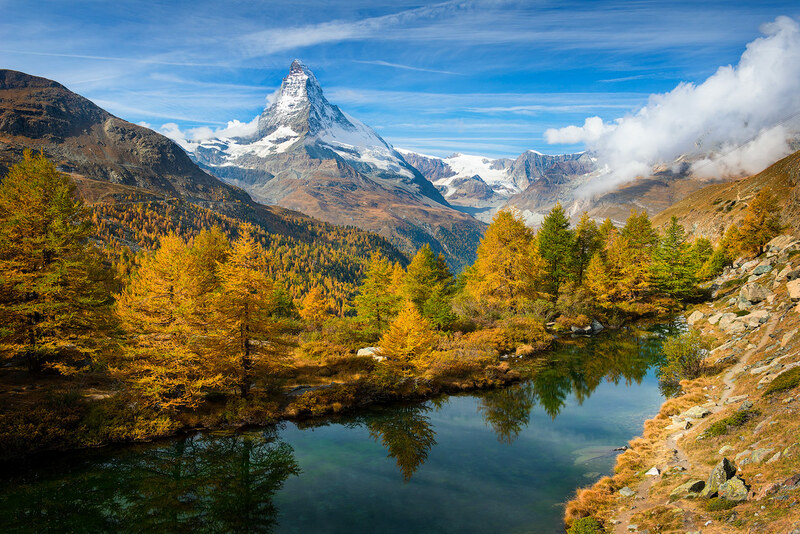 Those seeking for a photograph in Autumn with the Matterhorn and the golden trees a stay in September / October is recommended. Tip: Check the mountain inn Fluhalp in advance to find out by which date the accommodation is open – with the last possible appointment you will usually make a good deal. During Winter the 3rd week of January has been the best experience so far. In 2016 and 2017, we each had seven steel-blue days with little tourists and a good selection of free and cheap hotels / apartments. The temperatures were very low (-5 to -15 ° C in the village) but you are in the mountains after all! Although Zermatt is worth a visit all year, the months May and November are less recommended. For hiking and skiing it is either too early or too late. Most lodges / mountain hotels only open in June and close again at the beginning of October. 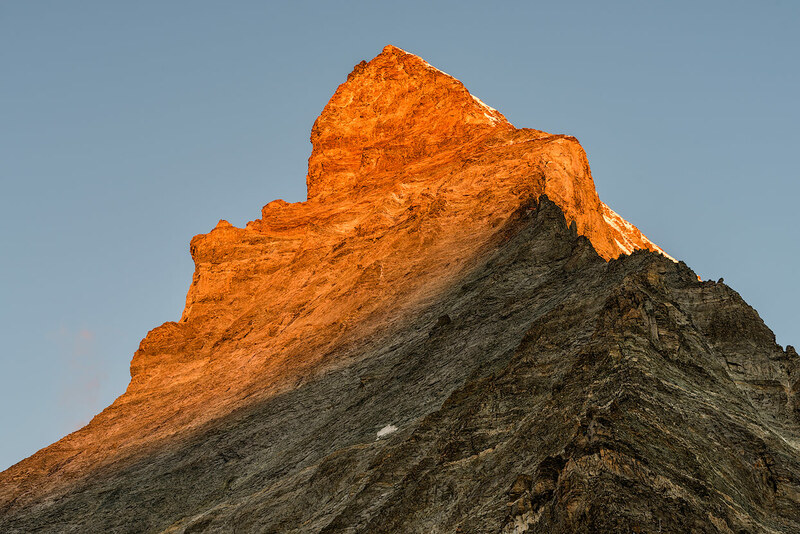 The best spots are located on the Sunnegga / Rothorn side, from where the beautiful shape of the Matterhorn is the best. 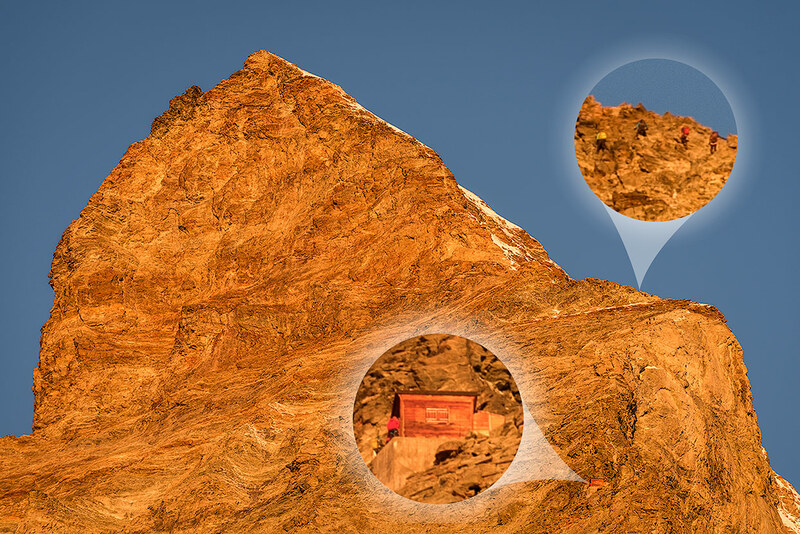 But in the village of Zermatt there are also good spots and if you are well on foot, the many hiking trails and mountain huts offer more attractive locations with wonderful views of the «Horu». 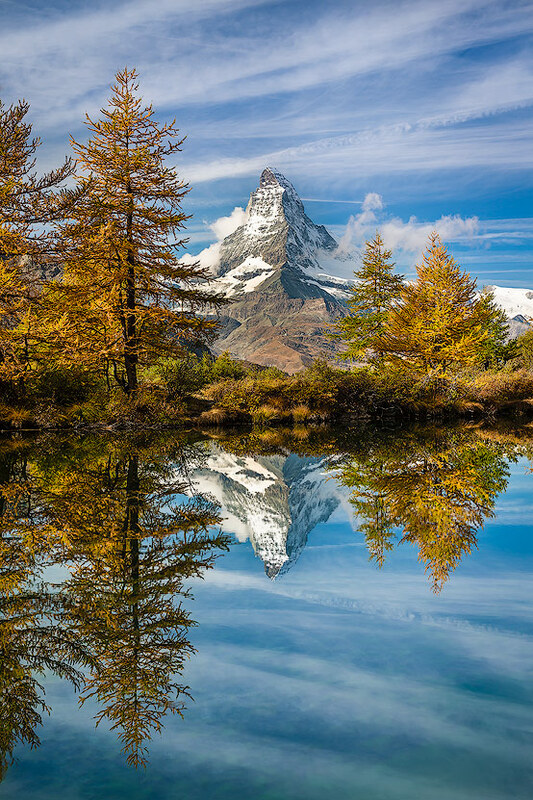 The most beautiful Matterhorn reflection can be found at the Stellisee. 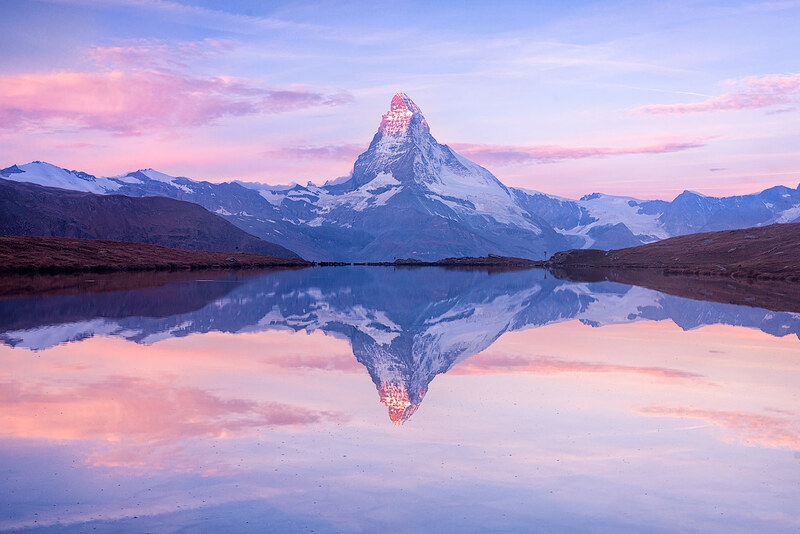 As a photographer you should be at sunrise before the mountain and the purple-colored sky is reflected in the lake. 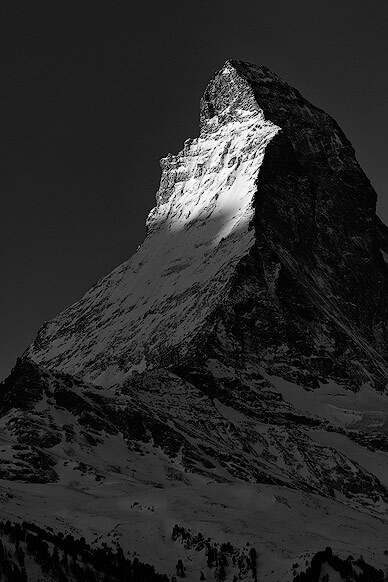 The east side of the Matterhorn is beautifully illuminated by the first sunrays. 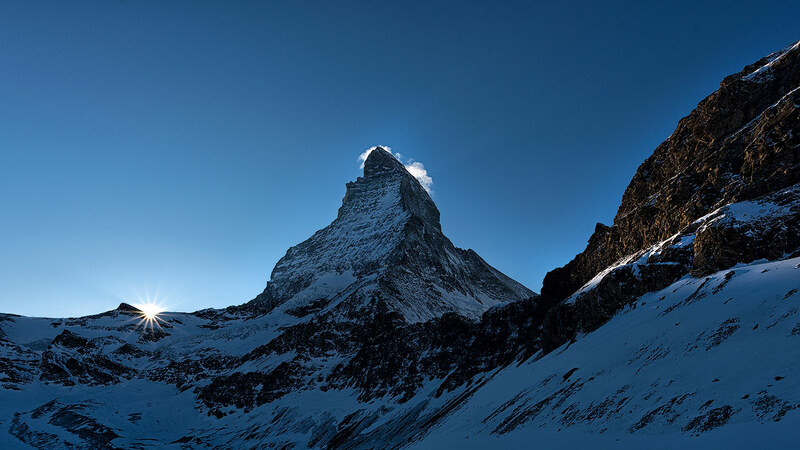 But the sunset is also worthwhile depending on the month, when the sun disappears just next to the Matterhorn. 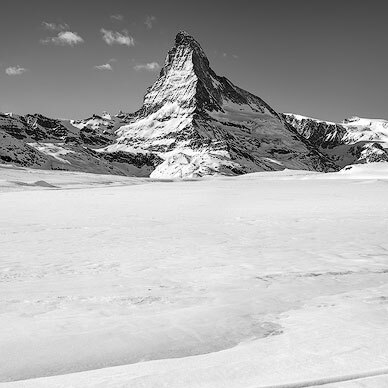 During Winter, the Stellisee is frozen and covered with snow, which is why only the snow-free months (May / June – September / October) are recommended. Perfect reflection of mount Matterhon (Mont Cervin) on Stellisee. Early morning shot. During Summer you can camp at the lake (no official campsite). The mountain inn Fluhalp is situated at an altitude of 2620m, where you can spend the night from June to September / October. A reservation is, of course, required, although at times I have been able to get a room on short notice. The fastest way to Stellisee is by foot via Blauherd (via Sunnegga). 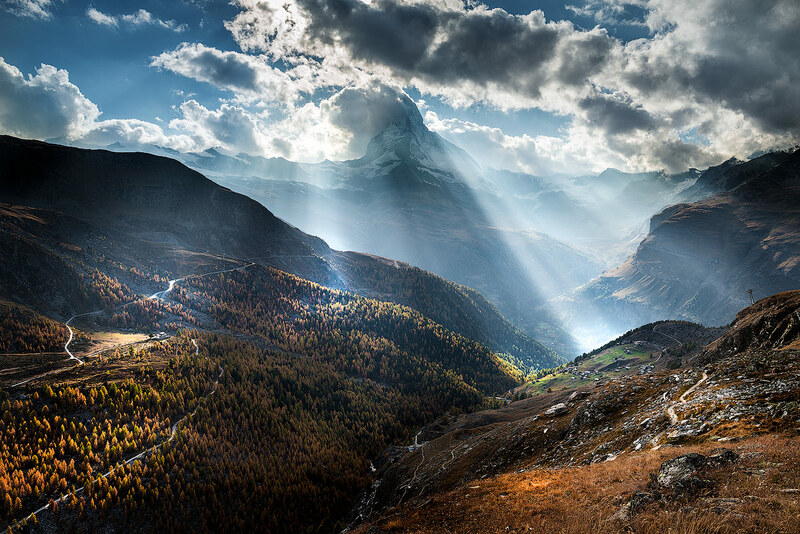 The journey from Zermatt to Blauherd takes about 20 min. After another 20 min. on the wide and well marked hiking trail you reach the Stellisee. The first train leaves at 08.00 a.m. and 08.30 a.m. in the off-season from Zermatt. The small and beautiful Grindjisee offers the perfect Matterhorn foreground. Especially during Autumn, when the golden yellow firs shine in the warm light. With a bit of luck you will also have a few veil clouds on the photo. The Grindjisee can be reached through a short hike from Stellisee, a tent or the mountain inn Fluhalp are recommended as accommodation. Usually it is also snow-covered during Winter. If you want to visit the spot during Winter, use the marked winter hiking path or the ski slope, which is very close to the lake. The mountain restaurants at Findeln are world-famous, accessible by footpath or direct from the ski pistes. The authentic barns and stores built of larch timber blackened by the sun are idyllic subjects for photographs. Particularly good photos are possible during Spring, when the flowers bloom or during Winter, when the landscape and the houses are covered with snow. If you prefer a slightly elevated perspective, you can use the chairlift during Winter. In Tufteren a stop is worthwhile not only because of the good apres-ski-restaurant, but also because of the view! The easiest way to reach Tufteren is with skis from Sunnegga or by bike or on foot during Summer. The hamlet of Tufteren (2,215 m) seems to belong to a long-gone age, with its small wooden barns and stores. For an authentic photo featuring old wooden houses, a flower-filled meadow and the Matterhorn, this is the perfect spot. View from Tufteren. Nice little mountain village with lots of old wooden huts. 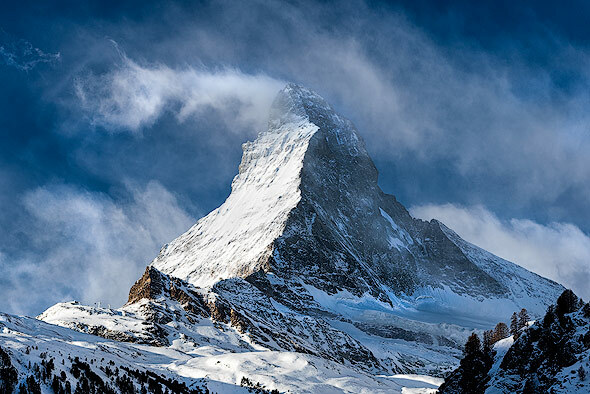 There are many cheap hotels with beautiful views of the Matterhorn and a photographer should consider a free Matterhorn view in the accommodation search as a „must“ criterion. Thus, the accommodation does not have to be left to photograph the Matterhorn. A popular viewpoint in the village is the church bridge (Kirchbrücke) – from hardly any other perspective the Matterhorn was photographed more often. This spot is especially recommended for sunrise and sunset. The brook and the Matterhorn are very good together in one photo. A beautiful view can also be found at the Matterhorn Express station. 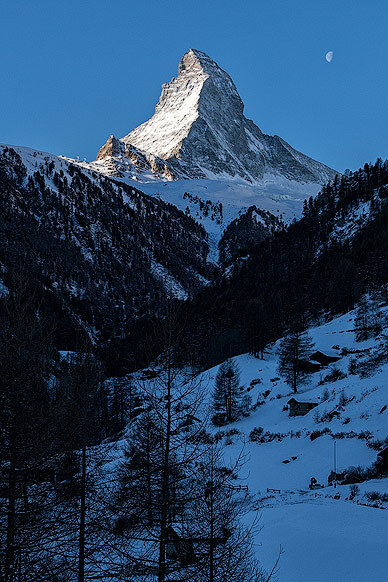 If you follow the small road from the station a few hundred meters uphill, you will be rewarded with a free Matterhorn view. 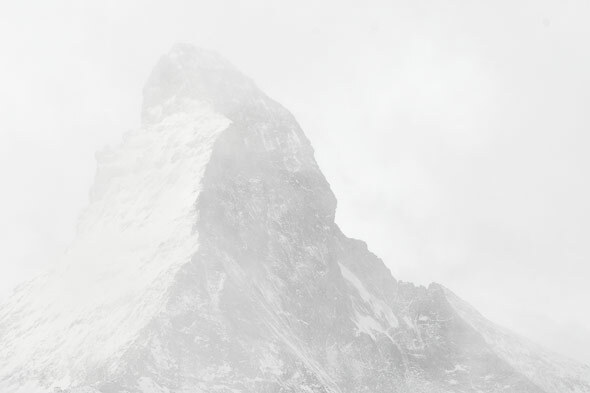 Matterhorn sitting on clouds. View from the Gondola station «Matterhorn-Express». The view from Riffelsee is also worth a photo, but the viewpoint on the Matterhorn from the Stellisee is definitely more photogenic. 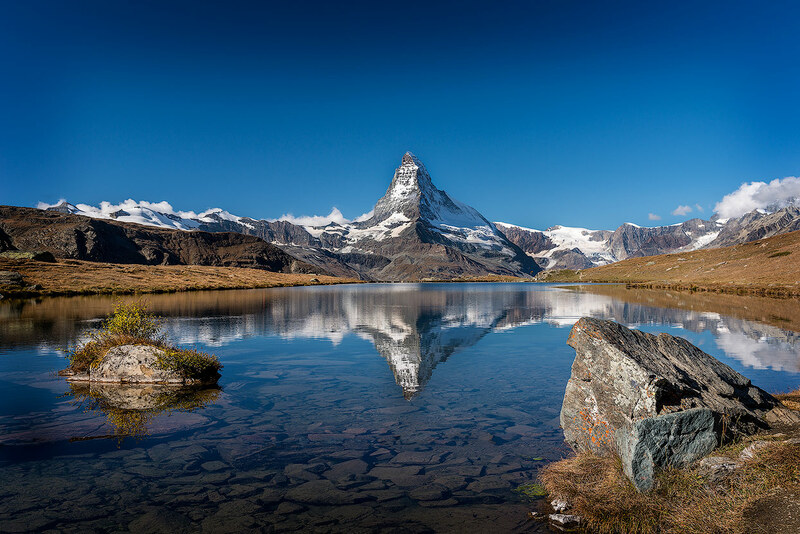 If you have enough time or you’re staying at the Gornergrat anyway, you should visit this small lake. The Riffelsee is much smaller than the Stellisee, so the chances of a perfect reflection without disturbing waves are greater. 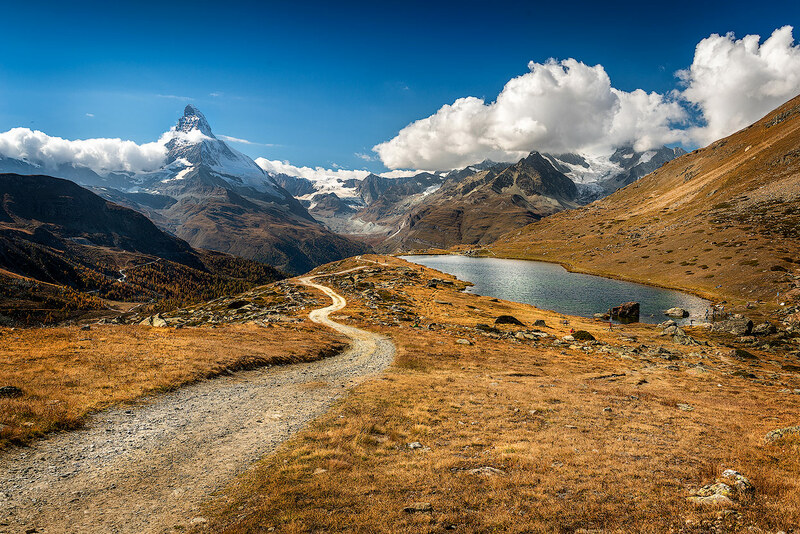 The best way to reach Riffelsee is the historic Gornergrat cogwheel railway (Stop at Rotenboden). Accommodation is available at the Gornergrat or on the Riffelalp. On the Gornergrat (3089m), there is a 360° panoramic view, including the Monte Rosa massif, so a visit to this summit should also be part of every visit to Zermatt. 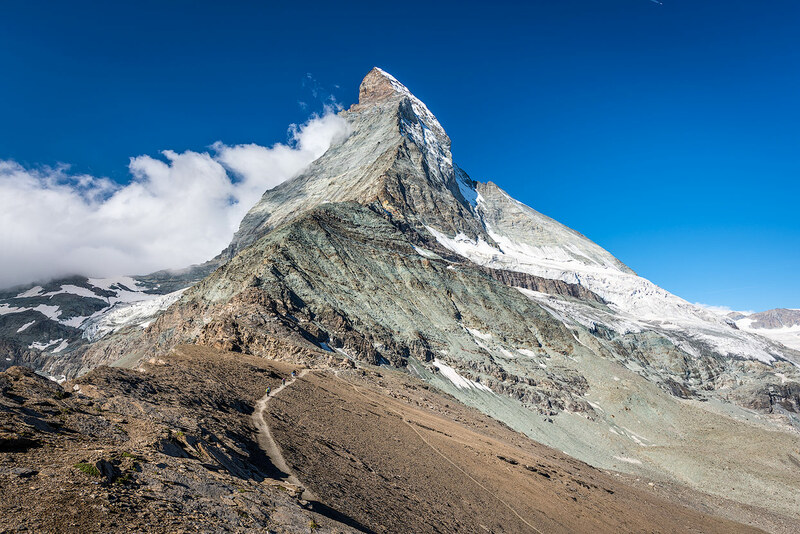 Mountaineers mount the Matterhorn, but for hikers there is the Hörnlihütte. 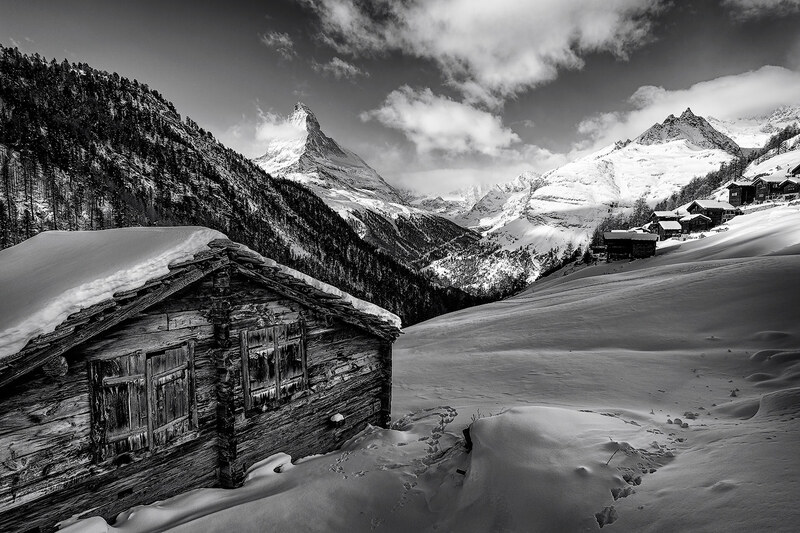 In this hut you can touch the Matterhorn so to speak. 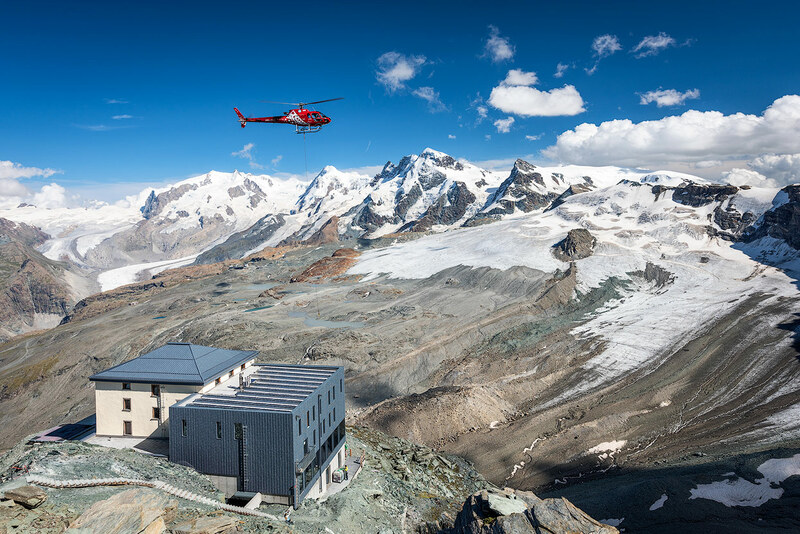 It is situated at an altitude of 3260m and was rebuilt in 2015, reducing the number of beds from 170 to 130. The Matterhorn climbers stay here just like the hikers. 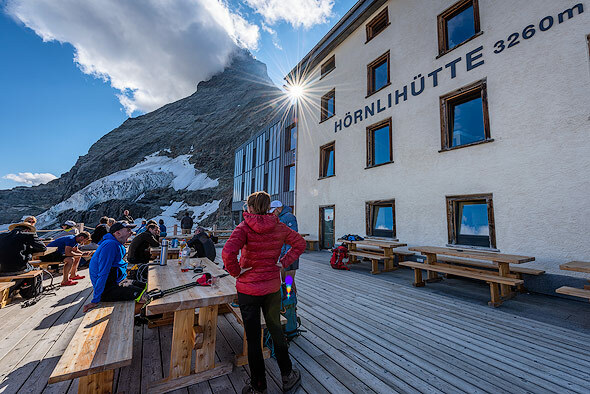 An overnight stay in the Hörnlihütte is a special experience, not only because of the photogenic perspective on the mountain. The mountaineers leave at 4 am and it is worthwhile to be there when the first groups leave the hut and start the ascent to the summit. You can not be closer to the action! An early reservation for a sleeping place is mandatory (check the website for more details, booking rules are changing from time to time as well as the prices). The fastest way to Hörnlihütte is via the Matterhorn Express. From the Stop Schwarzsee (2583m) there is a well-developed hiking trail to the Hörnlihütte (hiking time approx. 2 1/4h). 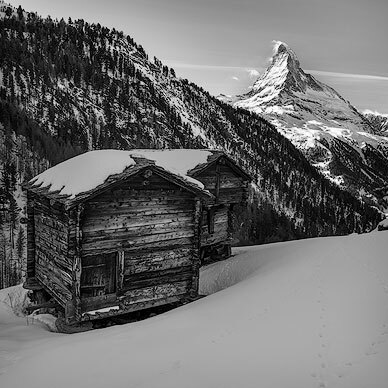 If you want to do it without the mountain railway, you can reach the hut from Zermatt after a long day’s hike. Transfer and arrival in Zermatt in the afternoon. Travel to Sunnegga via train and from there continue to Blauherd via the gondola. Short hike to the Stellisee and photo session. Where is the best spot for the sunset? Check in at the mountain inn Fluhalp or camp on the lake. Back to the Stellisee and taking photographs of the sunset. Taking photographs of the sunrise at Stellisee (reflection of Mount Matterhorn). Breakfast and checkout at mountain inn Fluhalp. Hike to Grindjisee and photo session. Hike to Findeln and photo session. 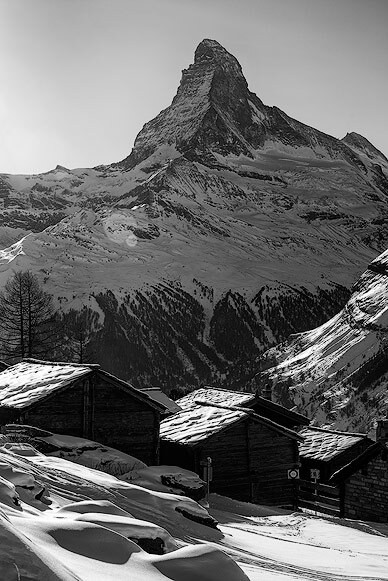 Back to Zermatt (via Sunnegga mountain railway or hike to the village). 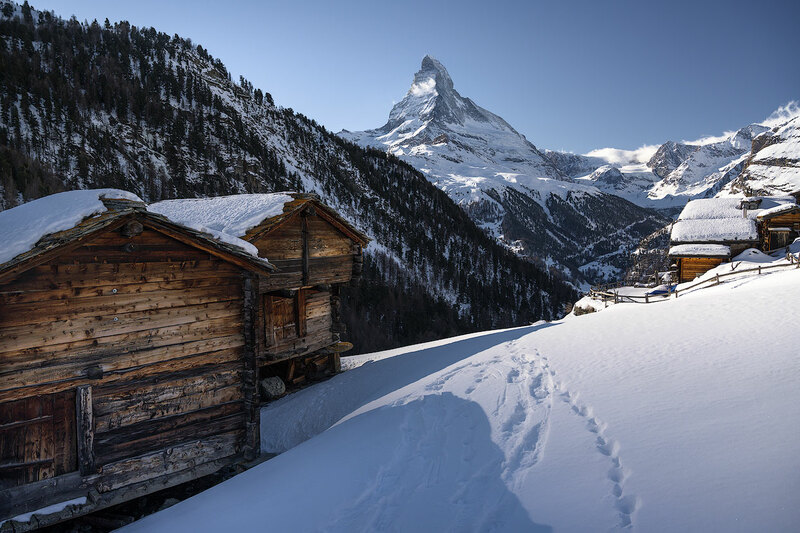 Overnight stay in the village with a view of the Matterhorn. Taking a photograph of the sunrise from the balcony or from the church bridge (Kirchbrücke). On foot or with the Matterhorn-Express to Schwarzsee. Hike to the Hörnlihütte (Base Camp Matterhorn). Overnight stay in the hut. Back to Zermatt (on foot or with the Matterhorn-Express from Schwarzsee). 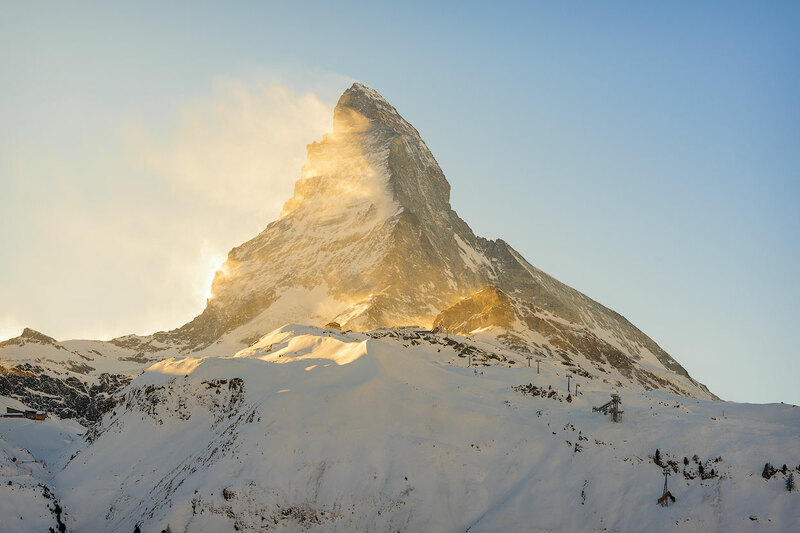 Visiting church bridge (Kirchbrücke) and shot Mount Matterhorn in the Afternoon with a nice sunbeam. This is the hiking trail to Hörnlihütte. Can you see the hut? Matterhorn trek (5-day hike from hut to hut). 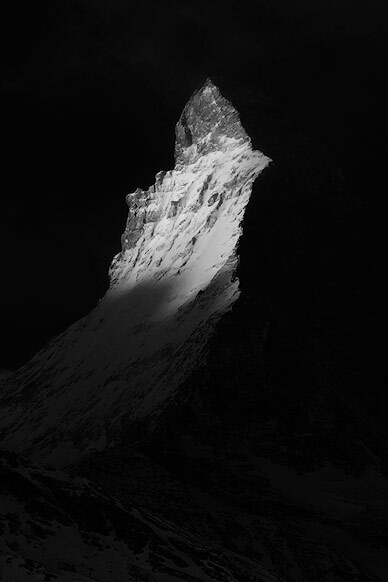 Overnight stay on the Gornergrat or Riffelberg. 2-days hike to the famous Monte Rosa Mountain hut (with crampons over the glacier, book a mountain guide if necessary). Ascent of Mount Breithorn with a mountain guide. 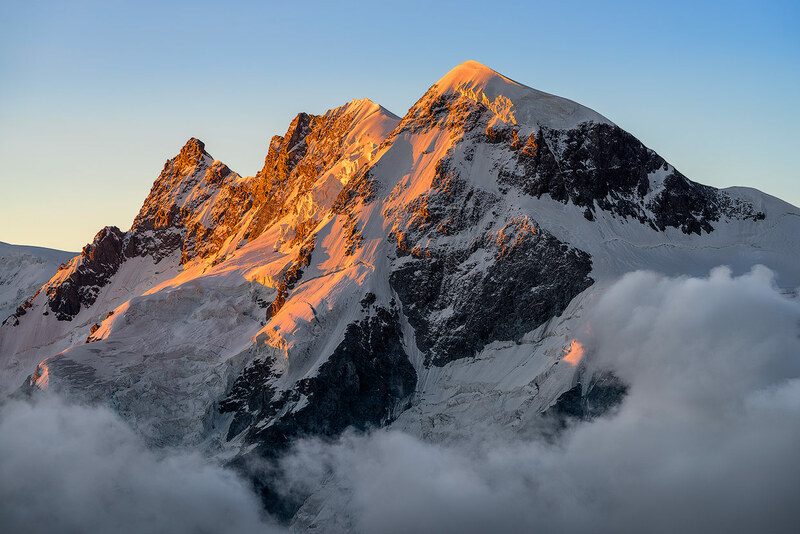 Breithorn is considered to be a comparatively simple 4000s. 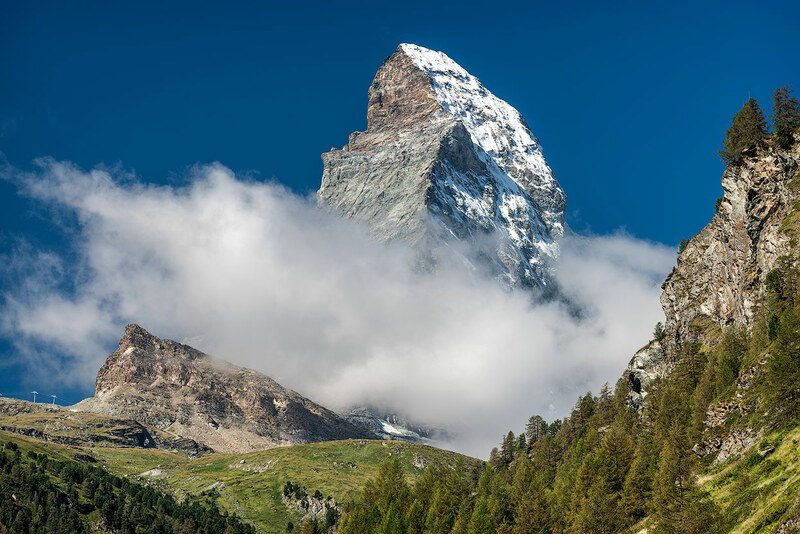 Half-day excursion with the mountain railways to «Kleine Matterhorn» (3883m). From here you can see the somewhat less spectacular south side of the Matterhorn. 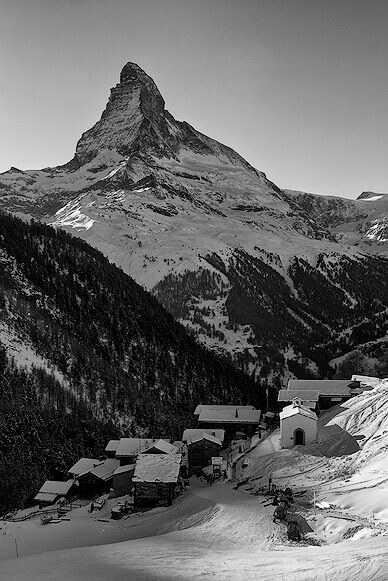 From the airports of Zurich, Geneva and Berne you can easily reach Zermatt by public transport. With the fastest connection you have to change trains only in Visp. 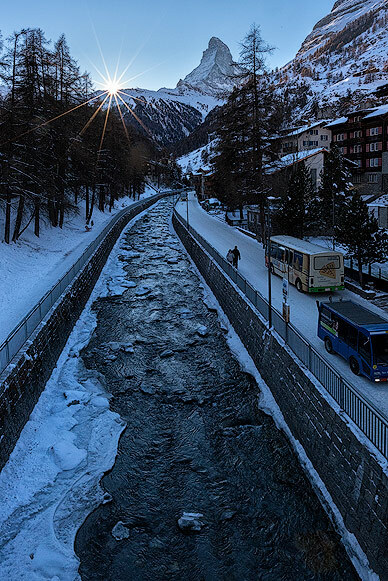 The world-famous Glacier Express runs directly to car-free Zermatt. 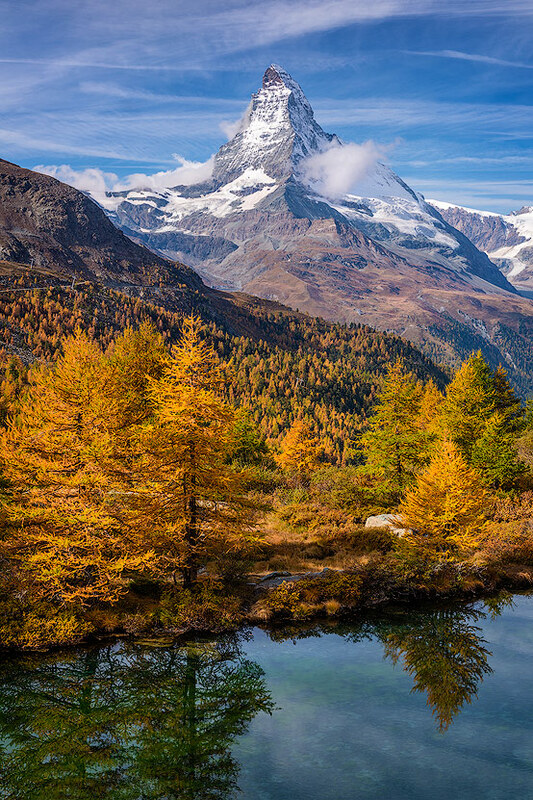 A trip to Zermatt by automobile ends 5 km away in Täsch. Then it continues by shuttle train to the car-free resort (1,620 m) at the foot of the Matterhorn. 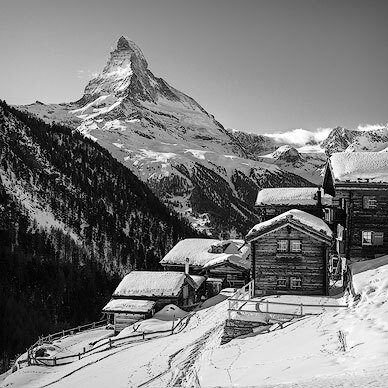 Taxi companies offer alternative transportation from Täsch to Zermatt.